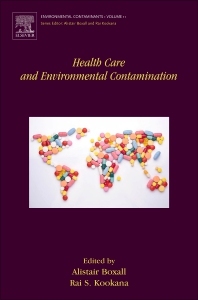 Health Care and Environmental Contamination provides a comprehensive explanation of new and evolving topics in the field, including discussions on emissions from pharmaceutical manufacturing, disposal of medical wastes, inputs from sewerage systems, effects on aquatic organisms and wildlife, indirect effects on human health, antibiotic resistance, stewardship, and treatment. These important issues affect the natural environment, making this first book on the topic a must have for comprehensive, broad, and up-to-date coverage of these issues. Dr Rai Kookana is a Chief Research Scientist with CSIRO Land and Water, Australia. He is leading a research team on environmental chemistry and ecotoxicology of emerging contaminants. Rai did his PhD from the University of Western Australia (1989) and joined CSIRO as a research scientist in 1992. He has published several books, 25 book chapters, 240 journal papers, and many other peer-reviewed articles, on environmental fate, effects and ecological risk assessment of organic contaminants in both terrestrial and aquatic ecosystems. His current ISI H-Index is 38 with total citations > 6000. Rai is on many national advisory committees and boards (e.g. the Science Fellow of Australian Pesticide and Veterinary Medicines Authority (2009-current) and is on editorial boards of 4 international journals. He has been one of the key advisors to IAEA/FAO Joint Division on Food and Environment CRP on pesticides involving several Latin American and Asian Countries. In 2012, Soil Science Society of America selected him as a Fellow of SSSA. Rai is currently serving as the Vice-President of the IUPAC Division on Chemistry and Environment.